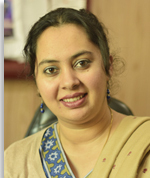 Dr. Sameen Masood holds a PhD in Sociology from University of Leicester, UK. She has previously worked in Iqra University and Hamdard University Islamabad. Her expertise is in Sociology of Education with a special focus on the dynamics of higher education. She is an active part of Centre for Education Policy and Development at ISCS. Parallel to this she has immense research interest in Rural Sociology and Disaster Management. She has published in these areas in international journals. Her teaching focuses on Research Methods (both Quantitative and Qualitative), Sociology of Education and Development Studies. She has international teaching training (PTLLS) from UK.